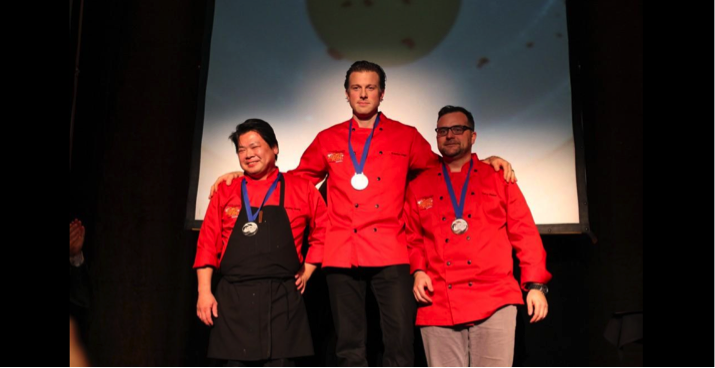 Hawksworth Restaurant’s Chef de Cuisine Kristian Eligh proved his culinary prowess last night, taking home the gold award at the Victoria 2014 Gold Medal Plates competition held at the Victoria Convention Centre. Chef Eligh went head to head with eight of the province’s finest chefs at the prestigious culinary competition and will now go on to compete at the Canadian Culinary Championships, the Gold Medal Plates Finale, in Kelowna on February 6 and 7, 2015. Tribute Series Chardonnay ‘Kelly Hrudey’ Old Main Road Vineyard. Wesley Young from Wildebeest took home the silver medal and the bronze was awarded to Terry Pichor from Sonora Resort. Proceeds from Gold Medal Plates go to the Canadian Olympic Foundation, supporting programs that further Canadian high-performance athletes’ pursuit of excellence on the world stage – programs such as Own The Podium and COC’s Athlete Excellence Fund. Since 2004, Gold Medal Plates has generated over $8.2 million for Canada’s Olympic athletes. Judges for the British Columbia competition included notable media and food critics: James Chatto (Head Judge), Andrew Morrison (BC Senior Judge and Judge/Referee), Gary Hynes, Sinclair Philip, Shelora Sheldon and last year’s Victoria winner Chef Brian Skinner. Each dish was judged out of 100 points, based on visual presentation (20%), texture (20%), taste (30%), wine compatibility (10%), originality (10%) and wow factor (10%).